By 2020 NASA aims to have a next-generation Curiosity rover on Mars to search for signs of organisms that could have lived on the Red Planet, and to collect a cache of deep-drilled rock samples for eventual analysis back here on Earth. The space agency has already said it plans to send another rover to Mars, and by reusing the proven Curiosity technology it can bring the entire mission in for under $1.5bn. Now that the original rover has shown that the conditions existed on Mars that would have made life possible, the next mission will try and find it – if it exists. For the last five months, NASA's science definition team (SDT) has been working on this plan, and at a press conference on Tuesday they produced a 154-page report detailing how the goals of the next mission can be achieved using currently available technology. "One of the very biggest questions for humankind is 'Are we alone?'" said Lindy Elkins-Tanton, SDT member. "That is the question we're hoping to make really big advances with with this Mars 2020 mission." The proposal is to send the new rover to more-inaccessible areas of Mars that may be hiding evidence of life itself, and have it drill out samples of scientifically selected material for eventual return to Earth. The plan is to drill 31 core samples, to be deposited in a specially designed container ready for shipment back to Earth. That retrieval will take another mission to achieve, and NASA didn't rule out the possibility that the cache could be picked up by human explorers, if funding is available. Drilling is important because the current surface of Mars isn't exactly supportive of life. But by examining the geological record, scientists could get a clue as to whether life formed, by picking up biosignatures from the rocks. 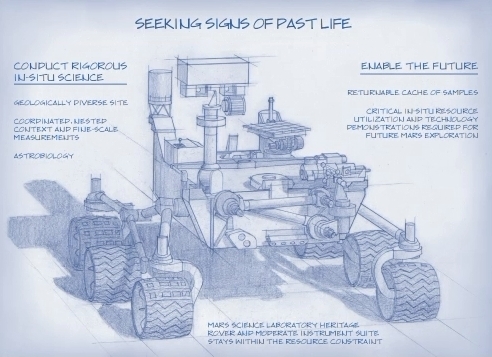 The new rover will have enhanced imaging, chemical sampling, and drilling equipment to enable Earth-bound controllers to pick the most likely prospects for life. At the press conference, SDT chairman Jack Mustard said the most likely sources would come from water channels carved in rocks that may be found by an organic carbon detector that could be built into the robot. Based on observations so far, it seems that Mars has gone through three distinct phases. Early in its life – around four billion years ago – the planet was wet and had a magnetic field that would have provided any life on the surface with some protection. That period was followed by about a half-billion years of geological disruption and volcanic activity that chilled the surface down, and for the last 3.5bn years it has been the largely arid rock we know today. Assuming that life would develop on Mars in a similar way to that on Earth, it's that first period which looks the most promising. Drilling into older rock formations, particularly those which are not exposed to the full force of surface conditions, will give the best chance of finding signs of life – again, if it existed.